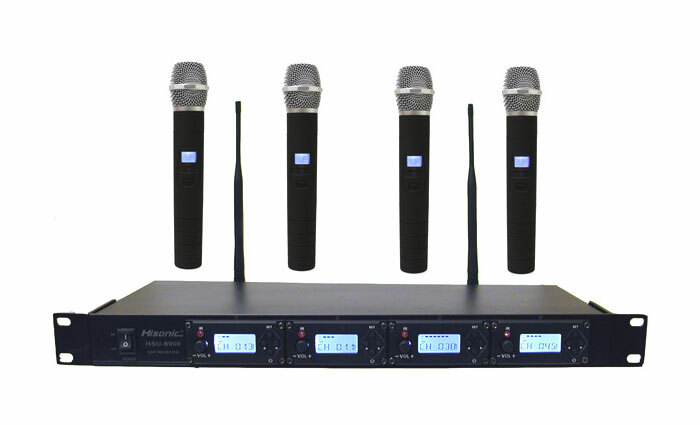 Each HSU8900 Series UHF wireless microphone system includes one receiver and four handheld transmitters, each of which has 100 selectable channels so it's much easier to avoid any unpleasant interference from other sources and for easy system expansion as well. There are 4 handheld microphones included, you can use any combination of 4 microphones at one time. This system is built with an auto pairing function, you do not need to worry about channels, it just match channels if needed, easy to use, never worry interference from other sources. If you like other combination of the microphones, like one body pack transmitter and three handheld microphone, just give us a call , we make customized system for you !